“The overall indication from various departments has not been entirely negative…” Datuk Michael Tang, Executive Chairman, GCM Resources. GCM Resources has only one active project, the Phulbari coal project: this is a plan for an opencast coal mine in north western Bangladesh. The project has been stalled for years as it awaits permission from the Government of Bangladesh. Every year, at the company’s AGM, they tell us that one day it will go ahead, despite fierce local opposition and government ambiguity. Goodness, what a ringing endorsement of so many years of work! 1. Michael Tang was joined on the directors’ table by Nik Raof Daud )Non-executive Director) and James Hobson (Finance Director) and, unlike last year, by Chief Operating Officer Gary Lye. 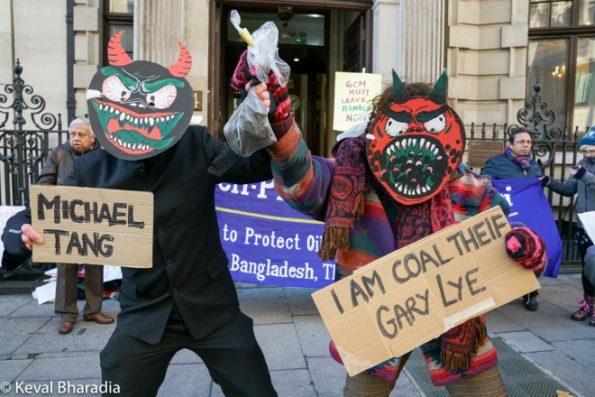 Gary Lye joined last year’s AGM by skype from Bangladesh, apparently to save costs. The company had apparently decided to throw caution to the winds and actually bring the man to face shareholders in person. 2. Michael Tang began the company’s AGM by reporting that GCM had continued to make progress with its principle partner, China Gezhouba Group International Engineering Company Limited (CGGC, ultimately owned by the Chinese Government). The two companies were working together on a proposal for a mine mouth power plant to provide an integrated power solution for the Government of Bangladesh. 3. Last month, GCM had raised £2 million before costs, enabling all shareholders to participate in enabling GCM to continue pursuing its strategy of a joint mine and power plant proposal. There were significant challenges ahead, he said, “not least, achieving approval” to go ahead. But the company was moving in the right direction and hoped to continue the momentum in the New Year. 4. The Chairman then moved the formal business of the meeting. He asked that anyone raising questions give the number of their shares – a most unusual practice. But at least it makes clear that companies are not democracies, but plutocracies. All items on the agenda were passed, of course. The AGM was then formally closed, and only then were ‘general questions’ taken. This is poor practice but it seemed a waste of effort challenging it, as I had done so before to no avail. 5. When Michael Tang called for questions, there was silence. Perhaps everyone was simply too appalled to speak – either (like us) out of horror at the massive destructive potential of the Phulbari project or (for the handful of other shareholders present) frustration at the company’s continued failure to get on with it and make a return on their investment. 7. Michael Tang was clearly discomfited by this question – again. He replied, “Um, we’ve not had a meeting… um… with the Prime Minister… um… herself yet.” However, they were continuing to work with departments under her, including a ministry that she chairs personally, in addition to being Prime Minister, and which oversees the Phulbari project. 16. In response to a remark by another shareholder, Nik Raof Daud said that the company’s annual report makes clear that there has been a definite change in strategy, and that is to approach the project as a package with a power plant. It is no longer just a proposal for a mine. It is clear that the proposal involves a 2000 Megawatt (MW) mine mouth power plant, as the country needs energy, and the proposal to have imported coal is expensive and the infrastructure challenging. The board believes that this is an added value strategy. This is different from the proposal submitted twelve years ago, he said. 17. Brian Mooney pointed out that the scheme submitted twelve years ago did include a mine mouth power plant. 20. Michael Tang said that the Government of Bangladesh had recently awarded coal fired power plant contracts to the international investing community. Prior to this, the largest power plant in the country was only 250 MW. Government energy source policy had been issued and clarified. GCM is in a much better position today than a couple of years ago. The coal fired power plants already awarded are premised on imported coal, which is costlier than domestic coal and requires infrastructure as well as representing an outflow of foreign exchange. 22. Michael Tang said that infrastructure would have to be constructed but that Phulbari was no further from the coastal power plants than the overseas coal sources. 23. Gary Lye added that Bangladesh was “blessed with mighty river systems” so it would be easier for GCM to supply coal all over the country than for imports to take place, with the necessary construction of major ports. 25. Michael Tang said he was not aware of that press report, but the company had met with the ministry, including the minister himself, and no such statement had been made to them. The ministry continued to accept GCM’s annual payments for the lease rights. 30. Samarendra Das pointed out that Phulbari had been a case study in the United Nations gathering on business and human rights the previous week in Geneva and asked whether Gary Lye was aware of this. Gary Lye suggested he was unaware of it. 36. Michael Tang suggested that Sam organise a separate forum if he wanted to discuss these issues. 37. Brian Mooney asked Gary Lye to explain what was happening locally. “Do we actually have a full-time office and staff in the region?” he asked. 39. Another shareholder said it was very heartening to hear this. “We as shareholders do not get to hear a lot of this information, only finding out at AGMs,” he said. “Can the company be more informative more often about the various things going on?” He said he was concerned about the ‘consistent aggression’ of the share price. He said that a statement had been issued in May about a power plant consulting group. An agreement had been signed. Was the board confident that the points covered by this agreement would be concluded in the agreed time scale? 40. Michael Tang said that the company was in discussions with CGGC. Six months had gone by, but CGGC are a very large organisation and have “many departments to get through in terms of the paperwork we are discussing with them.” He said that discussions should be finished by 30 June as in the agreement. 41. I asked whether international moves against coal use, including political agreements on climate change and changing behaviour among investors, made the Phulbari project less likely to go ahead. I mentioned that French President Emanuel Macron had made a renewed call for ending coal use in recent days. 42. Michael Tang replied that internationally this would have an impact but that Bangladesh is a developing country with limited resources. Coal is relatively affordable. With the new generation of coal power plants, environmental issues are adequately addressed. Coal will remain a critical source of energy supply for developing countries that do not have access to natural gas or solar, he said. 45. Another shareholder said that elections were due in Bangladesh in the next twelve months. Would this have a negative or positive or no effect? 46. Michael Tang said it would have a positive impact on the Phulbari project. Brian Mooney asked why. Michael Tang replied that the project had “attracted a certain controversy, not least from our friends in this room.” With a new mandate and a new government in place, GCM would be able to move a lot quicker. 48. Michael Tang said that he could not comment on this, but he expected a faster pace of implementation by ministries. 49. Gary Lye added that this election would be different from previous ones. The government is in a much stronger position, and more confident, and “this flows on to bureaucrats.” The election “looks smoother than in the past,” he said. Government and bureaucrats are more confident and are delivering on commitments about power supply. 50. Another shareholder noted that there had been a 6% increase in shares issued. No information had been made available as to who were the guarantors. 51. Michael Tang said that following share placement, GCM did not receive any notification of any new shareholders exceeding 3% of the total shareholding. Underwriting was secured through a bid, and the board could not provide further information because of commercial confidentiality. 53. Michael Tang said that the consultants were based in Beijing and they were the nominated entity, but GCM may be the only public company they have dealt with in the recent past. They consult on energy and power within China. 55. I asked why GCM continued to be listed in London, given the heavy Chinese involvement and the secrecy surrounding key people involved. 56. Michael Tang replied that London is a leading financial centre, “so there is an advantage to listing here, and we see no reason to move to another market.” He remarked that in future it may be appropriate to list elsewhere and that one advantage of doing so might be to avoid the presence of objectors within the AGM. I thought this was a little pointed. 64. Various informal conversations followed, and it seemed to me that some shareholders – not from our network – were not happy about the amount of information they were being given. I find it extraordinary that anyone would put money into this project, but there we are.